We are pleased to announce that the Italian translation of the USA country guide is now available on our website! In the age of the great Italian emigration toward the ” New World”, the reasons to escape from Italy were: high taxes, low wages or few work prospects (well, all of these still exist today). From 1890 to 1900, more than 65o,ooo Italians arrived in the United States, many of whom became manual labourers. By the 1920’s, the Italian-American population grew richer as workers gained skills and entrepreneurs opened restaurants, groceries, construction firms and other small businesses. 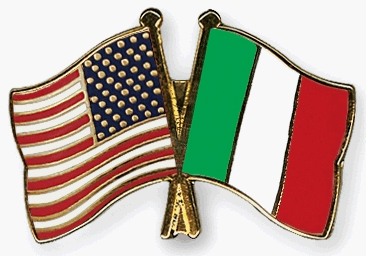 In the 2006 U.S. Census, Italian-Americans constituted the fifth largest ancestry group in America with 17.8 million persons, or 6% of the total population. America has been a leader in scientific research and technological innovation since the late 19th century. This is one reason why so many Italians come to the United States: to study and work. Unlike the US, Italy has one of the lowest funding rates for scientfic investigation, causing Italy to contribute to the “brain drain”. Apart from the fact that the USA is called the “home of the free”, the US bureaucracy paradoxically makes immigrants’ entry not so free. The laws are so strict, and even to clear customs you must meet meticulous requirements. Since the US heightened national security after September 11th, every foreigner’s trip to America is filled with as much regulation as going to the moon. A lot of people coming to the USA pretend to be visitors, and immigration officers can be ruthless toward those bearing false witness – even to the point of denying you entrance to the country. That’s why you have to take a lot of care with your visas, permits, and even what belongings you bring with you. There are some articles which are duty-free if you’ve had them more than one year – are you sure you used your bed sheets and carpets enough before taking them to the USA? Don’t be worried if this sounds like a lot to handle – our Visas and Permits section outlines all the requirements. For other questions such as where to live, how to change your money, and how to find a job, our USA guide offers you practical information for your relocation. And if you want some firsthand experiences from other expats, you’re welcome to join our USA community. Siamo lieti di annunciare che la traduzione italiana della Guida degli Stati Uniti è ora online! L’America è leader nel settore della ricerca scientifica e dell’innovazione tecnologica sin dal tardo 19º secolo. Questa è una delle ragioni per le quali così tanti italiani vanno negli Stati Uniti: per studiare o lavorare. A differenza degli Stati Uniti, l’Italia ha uno dei più bassi tassi di finanziamento per la ricerca scientifica, che contribuisce alla “fuga dei cervelli” dall’Italia. A prescindere dal fatto che gli Stati Uniti vengano chiamati “la casa della libertà”, la burocrazia americana paradossalmente rende l’ingresso agli immigranti non così libero. Le leggi sono severe, e persino per le pratiche doganali puoi trovare requisiti meticolosi. Sin dall’aumento della sicurezza nazionale americana dopo l’ 11 Settembre, ogni viaggio in America per gli stranieri è più pieno di regolamenti rispetto a quelli necessari ad andare sulla luna. Molte persone che si recano negli Stati Uniti si fingono turisti, e gli ufficiali dell’immigrazione possono essere spietati verso coloro che dichiarano falsa testimonianza – fino al punto di negarti l’ingresso nel paese. È per questo che devi fare molta attenzione con i tuoi visti, permessi, e persino con gli oggetti che porti con te. Ci sono alcuni articoli esenti da dazi doganali se li possiedi da più di un anno – sei sicura di aver usato abbastanza le lenzuola del tuo letto e i tappeti prima di introdurli negli Stati Uniti?